Size matters. Especially when choosing the correct BTU size for an air conditioner. Choose too small a unit, you could end up with a room that's not cool enough, or with an air conditioning unit that overheats. On the other hand, too large a unit for the space will not remove the necessary moisture from the room, making it feel clammy and uncomfortable. Here’s how to calculate BTU to find the perfect AC unit for your needs. A BTU or British Thermal Unit is a measurement of how much energy is required to raise the temperature of one pound of water by one degree. That might not sound useful when it comes to air conditioning your home or business but the underlying calculation is critical to staying comfortable. Each air conditioner or heater is rated to produce a certain number of BTUs. Many factors go into calculating BTUs, so we have put together a set of tools to help with air conditioner sizing. The chart below is a great starting point for sizing your AC. These BTU calculations are based on a standard room with 8-foot ceilings, two windows and one door. If the room has more windows, doors or higher ceilings, adjust the BTUs upward. Other factors in determining the BTU size would be the room’s purpose. Kitchens normally have more heat thanks to stoves and ovens, and rooms with computers and other electronics give off extra heat. Therefore, these rooms would require bumping the air conditioner size up. Wondering what size air conditioner you need? 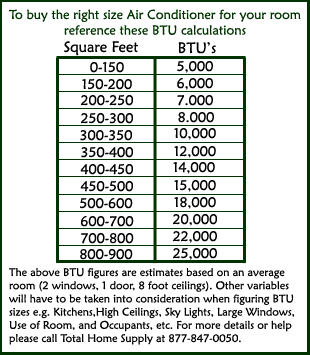 Our BTU calculator is designed to determine how many BTUs are needed for a single room. This calculation will not work for a whole house or commercial location, but is ideal for determining your mini split, through-the-wall, PTAC or window AC size. We have used our years of experience in air conditioning to put together this easy-to-use BTU calculator. Simply fill in all the fields, and we will generate a number of BTUs that you should use. Use this number as a guideline when choosing what size air conditioner would work best for your room, whether it’s a window air conditioner or another type of small room AC unit. All calculations are estimates based on the information you provide. Again, this calculator is only designed to determine the needs for a single room, not an entire home or commercial business. If you are trying to determine the AC unit size for a multi-zone mini split, be sure to calculate each room individually then add them together. Finding the correct window AC size (or other AC unit size) is a priority to making your home comfortable. An air conditioner is an investment, so finding the right one the first time can make the purchase process go much more smoothly. Have a more complicated space or need help using this tool? We are here to help with your air conditioner sizing needs. Call us at 877-847-0050 or contact us online.